With over 30 years of multihull building experience combined with multihull power and sailing design. Spirited Designs was founded by Craig and Marina Schionning. Craig grew up living full time on boats from an early age and from here his passion for boats was kindled. 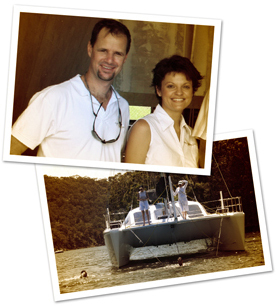 Spirited Designs specializes in multihull design and pre-cut kit assembly using cad-assisted technology. Craig’s practical building background combined with a good eye for modern flowing lines creates a good sound basis for not only a modern, safe and good-looking boat but an easy to build assembly process using the best choice in modern materials available. The Spirited 380 design was the first of the popular range to be released. Design was commenced in May 2005 with the public release in early 2006. A prototype soon followed and built by Craig to be launched in May 2007, just in time for the Sanctuary Cove Boat show. Named ’Spirited One’, this design was unveiled along side Stallion Marine's Spirited 380. Craig sailed ‘Spirited One’ from Port Stephens to Sanctuary Cove for the shake-down maiden voyage where they were met by Stallion Marine’s 380 at the Gold Coast Seaway as they entered for a memorable welcome. The two 380’s motored in company up the Broadwater to Sanctuary Cove Marina. The two 380’s made a real statement berthed side by side at the 2007 Sanctuary Cove Boatshow. Both boats were painted in metallic highlight panels and were floating high on their lines. Amongst mostly typical heavy FRP production boats the Spirited 380’s were like a breath of fresh air. 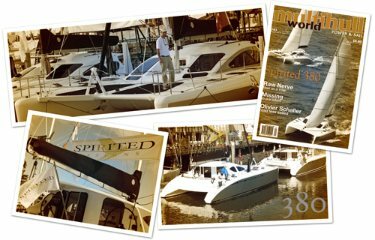 Shortly after the show these two Spirited 380’s were featured on the cover of the Multihull World Magazine in full flight. The popularity grew and the building process known as the ‘Spirited Assembly System’ became recognized as one of the easiest and quickest systems available. To date almost 40 of this design have been sold with 23 now launched. The Spirited 480 has now been released for anyone wanting the next level in cruising and performance. The Spirited Design team work well together in many areas to bring you the best possible product and service, from building and supplying your kit, to helping you assemble and finish your dream boat, we are there to help. Craig's hands-on approach sees him very much involved with the production aspect of the business. He likes to be involved from design through to the construction and especially sea trials. Craig's range of designs reflect his passion for functional easy to build boats without sacrificing style and performance. We hope you can appreciate our product and look forward to working with you in the future. If you have any other questions or queries regarding our products, please feel free to contact us at any time. Thank you for your interest in our designs and best wishes for your chosen project.